Moose bullet for 300 win, 180gr Accubond or E tip? I got a new 300 win mag last summer, a custom rifle I had ordered in from Rifles Inc. I shot it practicing last summer and then took it to Wyoming and shot a nice muley with it. I will be taking it on my moose hunt in Alaska 2018. I really like the rifle, it is a modified version of their lightweight 70 model. It weighs 7lbs 4oz with the Swaro Z5 3.5-18x scope, and recoil isn't bad with the brake. I plan to use it for elk and moose, muleys under some conditions. I have been shooting Nosler Accubond 180gr bullets through it. That is the load my turret is built for and it shoots great through the rifle. Recently I saw a box of the 180gr Nosler E tip factory ammo on sale so I picked it up to try. It shoots to the same point of impact as the Accubond handload I've been using at 100yds, shot a nice group just like the Accubond, and when I shot the 10" gong at 500yds it hit near center all 3 times. I will do a lot more practice shooting before my muley hunt this fall and the elk hunt, but early results look like the bullets will be able to be used interchangeably without adjusting the scope at normal ranges. Should I consider shooting the all copper E tip for the moose hunt instead of the Accubond? I've had great luck with the Accubond in the past but never shot anything bigger than elk with one. I have read all the stories about moose liking to fall in terrible places even after a good hit and would like to prevent that if I could. I've read some hunters like to break the shoulder with a really tough bullet to anchor them also. I could even mix the bullets if I wanted, an Accubond for the first one with a bigger wound channel and E tips after for follow up shots that may take more penetration. I took a nice Shiras bull moose here in Montana last season and used my 270wsm with factory loaded Nosler trophy grade 140gr Accubonds and it did the trick and performed perfectly. Had a small window to drop the bull without him getting into thick alders or the river. The moose was dead after the first shot but wanted him anchored where he was so I hammered him 2 more times for insurance and he piled up about 5-8 yards from my initial shot. I recovered 2 of the 3 bullets fired in the opposite side of the moose's hide and they were perfectly mushroomed and excellent weight retention. I don't have any experience with the E-tips but have no reason to go away from the Accubonds when they are accurate and flat out put animals on the ground. I've also taken 3 elk, 1 black bear and numerous deer with Accubonds with zero issues. Keep in mind moose are huge animals and even with a perfect double lung they can take 60-90 seconds or more to bleed out. My advice would be shoot for vitals and if you get a chance at a follow up shot shoot for spine or front shoulder to anchor but at least with a first shot in the vitals your going to recover the animal one way or another. Good luck and have fun on your hunt! If a hunter can't break a shoulder on a moose with either of those bullets out of a .300 Win mag, the issue is the nut behind the trigger. My dad killed a Shiras two seasons ago with a 180 grain e-tip out of his .300 win mag. One shot and it went down. Either of those bullets would serve you well! I would take the one that your rifle shoots the best. It sounds like your rifle likes both of those bullets. My son uses a 90 gr. E-tip in his 6mm Remington and he has used it to take a couple antelope and deer with it and it has performed very well on game. He also used it on his first elk which was a very nice cow at 350 yards. One shot tight behind the shoulder and the bullet traveled forward a bit and EXITED her opposite shoulder. She went maybe 20 yards and tipped over. Pretty impressive performance. I did bullet tests into water jugs at 25 - 100 - 200 - 300- 400 - 500 yards with E-tips, Accubonds, and Partitions. They all performed very well. If you want I could try and post up some of those bullet tests. I don't have an E-tip recovery from the 500 yard distance yet though. He's yet to recover an E-tip from an animal yet! Accubond, if you like to go for the boiler room through the ribs. E-Tip, if you prefer going through the shoulder. Nothing wrong with those either, I used to use them some before the Accubond came out. I switched because I was shooting a bunch and I liked being able to practice with the Ballistic Tip and hunt with the Accubond, it was cheaper. Partitions never failed me on deer or one elk. I used 150gr Partitions in a 270 back then. I've been a long time user of Accubonds although either would work just fine. FWIW- I shot last year's moose with a 180AB on a strongly quartering away shot (I thought #1 had connected and was trying to knock him down) and shattered its hip ball socket- smashed it to bits and that bullet kept on going into the boiler room. I wouldn't advocate that shot with anything but it sure as heck worked. Bullet held together better than I thought. Accubonds are excellent. I've killed several Moose with them. 200gr from my 325wsm. I've recovered a few and they all weigh 140gr, 70 percent of thier weight just like Nosler says they should. Velocity is 2950 fps, ranges 315, 375 and 150ish if I remember right. Broken bones, dead animals one shot kills. The only way the Moose is going to fall over in cns or heart shot. Usually with a heart shot they do a back flip. I've seen it many times. Double lung shot they don't even hardly flinch, you'll think you missed. It takes about 60-90secs for them to bleed enough for blood pressure to drop for them to fall over. You deal with them where they fall, that's just the way it is. My experience with them is similar, I've recovered a few from elk and deer that retained right around 70%. The ones recovered from deer were at tough angles, mostly on follow up shots. I haven't recovered many from deer and those I did were under the hide on the far side after a lot of penetration. 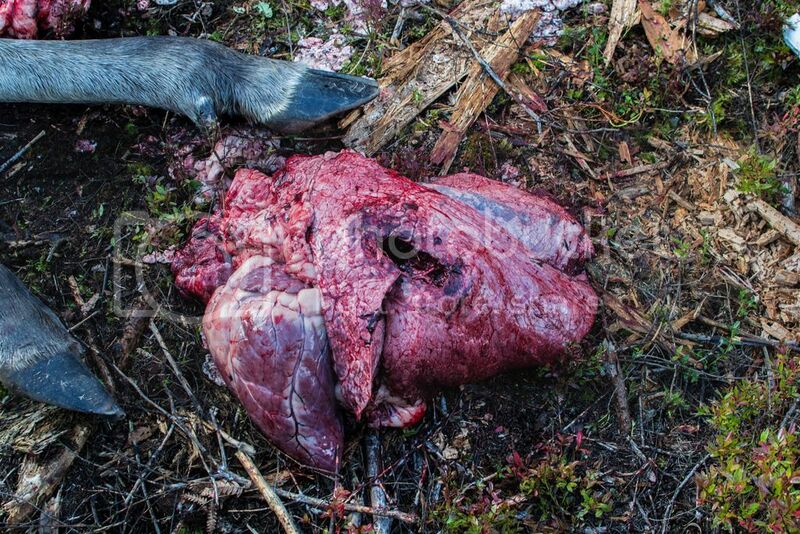 How often do you recover those from a moose, and how often do they exit? Thanks for the pics also, good looking mushrooms. 165 grn accubond 30-06 30 yd shot cow moose, she went about 10 yds then tipped over 20s after the shot. Entrance side lungs, bullet exited, she was perfectly broadside. If I were you, I wouldn't waste anymore time overthinking it. It sounds like you have found a bullet/load (or two) that works for you, I'd call it good. Like anything, shot placement is key and you place a good shot on any moose up here, at acceptable yardage (say 300 or less, even though they would probably do just fine at distances over 300, I have never liked the idea of LR hunting), with either one of those rounds, and you'll be notching your tag.